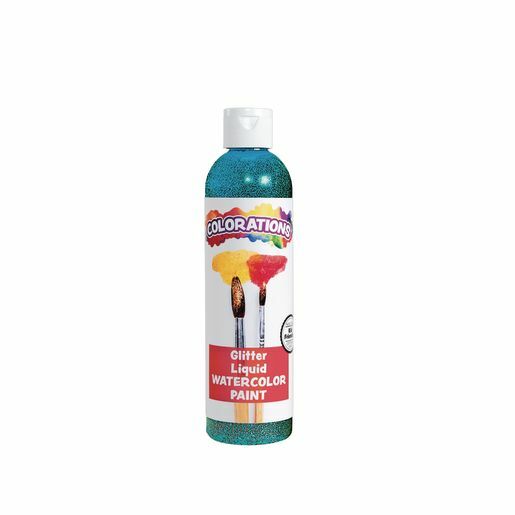 Colorations® Glitter Liquid Watercolor™, Turquoise - 8 oz. Add glitz, glimmer and shine to your every day watercolor designs! Colorations® Glitter Liquid Watercolor combines the ease of watercolor with the amazing vibrancy of color and glitter! Each bottle not only contains rich color but also matching colored glitter specially formulated to stick to paper projects. Squirt with droppers, spray bottles or brushes to give your artwork that extra shine! Why choose Colorations® Glitter Liquid Watercolor? Ease of watercolor and glitter combined! 8 dazzling colors to choose from: blue, green, magenta, orange, purple, red, turquoise and yellow. Why is Colorations® Glitter Liquid Watercolor an important part of Arts & Crafts curriculum? Encourages self-expression - watercolor art gives young artists the confidence to expand their creativity, and with Glitter Liquid Watercolor™, they can give their watercolor creations a shiny twist! Extends learning in the classroom - an art-enriched curriculum will helps kids develop critical thinking skills, as well as gives them the tools necessary to promote self-expression and problem-solving skills.